In the picture the mail car stands ready to leave from the Imperial Hotel, Galway bound for Oughterard/ Clifden. Bianconi still in his teens arrived in Ireland in 1802. He was Carlo (Charles) Bianconi an exceptionally talented entrepreneur. He noticed immediately that unlike most countries in Europe, Ireland had no integrated transport system. If you wanted to travel from Galway to Dublin, you either went on foot, rode or: if you could afford it, go by personal carriage. The final part of your journey, which took about three days, was probably by barge. 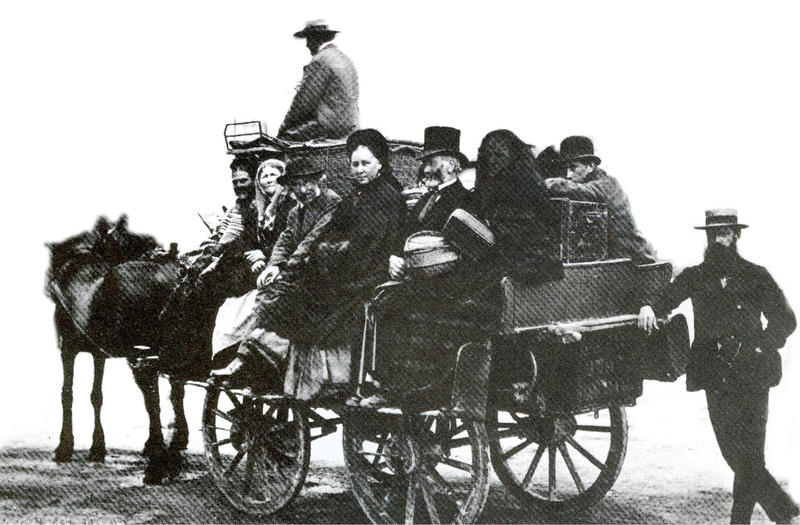 Bianconi set up a national horse drawn carriage service, with a workable timetable, offering connections from various termini, which, relative to the times, offered travelers some confidence that they’d arrive at their destination at a given time. 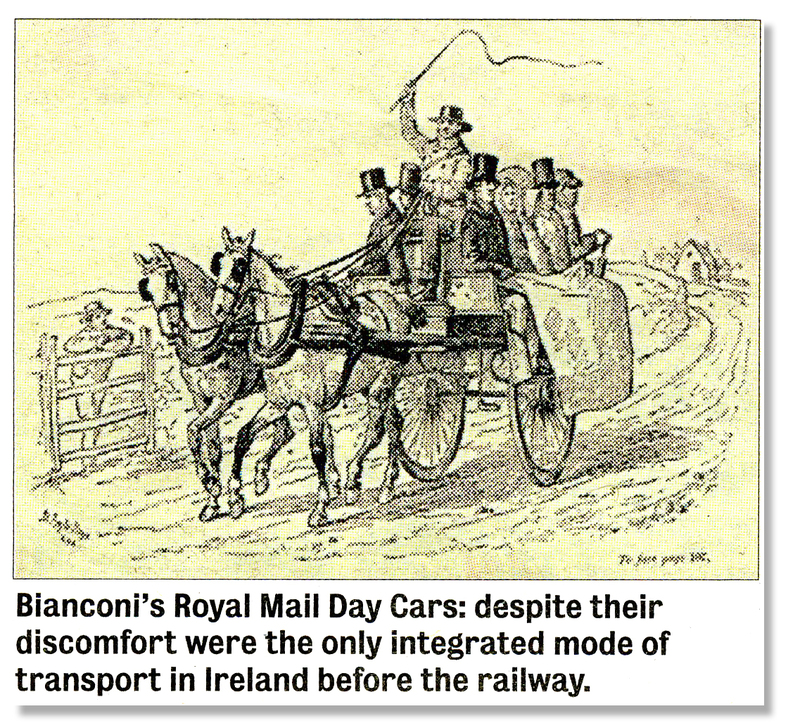 He called his enterprise: Bianconi’s Royal Mail Day Cars. The roads were bad, the coaches were open to the elements, but it was a highly successful transport system. 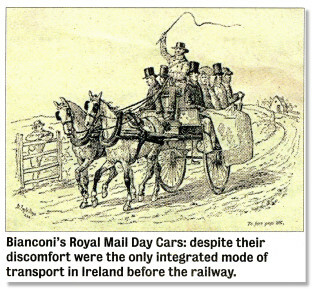 His Galway – Clifden service began in 1837, one car each way, everyday, and ran until the railway opened in 1895 – long after Bianconi himself had sold out and died. When this photograph was taken in the 1880’s, the fare for the fortynine miles was 7/6d plus “whip” money to the driver. It started from Galway at 9am and reached Clifden at 7pm. In weather, such as we have been having recently, it can hardly have been the most comfortable journey. On Tuesday August 18th 1835, Friedrich von Raumer, a young Prussian historian, “ mounted the upper deck of an open Bainconi coach, and we get some idea what travel in pre Famine times were like. Raumer had come to Ireland to see for himself how conditions were for the people. Although a Protestant he was critical of England’s tardiness in granting Catholic Emancipation, a hot topic at the time, which had been skillfully championed by the great Daniel O Connell whom Raumer admired. Sitting on his right was an old woman, opposite her two granddaughters, and beside these a second woman and her son. On his left an elderly man climbed up and sat beside him. The poor man appeared as if ‘he had dropped from the gallows.’ Clearly his clothes were in such a sad state that Raumer feared the man was ‘an expert in insects.’ He moved closer to the grandmother and off they went. The coach was full. Between the heaped up luggage sat a man on a trunk in a long coat. Another man,’a scoundrel’, sat opposite him on a travel bag. 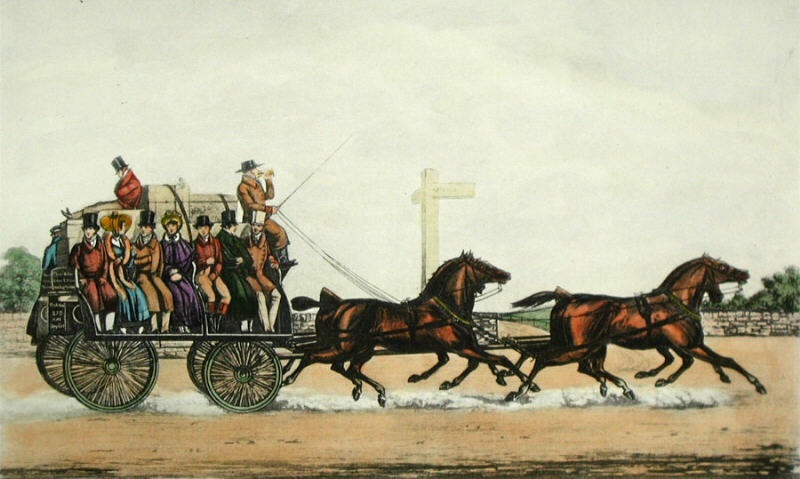 Three men sat beside Rodenberg: “one old and two young, all horse traders on their way to the horse fair. On another bench a further five people sat, wrapped in oilcloth and overcoats. Yet another man, equally wrapped against the weather, joined them along the way. As they set off the horse traders immediately befriended Julius, who was feeling miserable and sad. They took pity on him and did their best to make him comfortable, giving most of a leather blanket cover to him. They were evidently quite used to the rain, which ‘since leaving Galway had not ceased. ‘Passengers in front ate food and threw leftovers and apple skins into the air to fall on the passengers behind. Julius questioned why they were called ‘royal’ coaches, as they compared to nothing like the comfort of travelling in Europe. ‘It is a sad trick of fate that the royalty of Ireland had long been buried, its nobility now stands begging on the roadside, and these miserable hostelries and carriages are the last thing that can be called ‘royal’. Poor Julius was not a happy camper. Bianconi’s opened a series of Inns along his busiest routes. 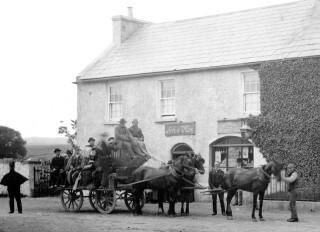 One of the Inns was at John Roes, Main St, Oughterard now Kenny’s Bar. Roe’s was also the agent for steam ship tickets to America. The two storey house just over the bridge at Oughterard on the Clifden Road had stables at the rear of the house where fresh horses were changed along the Oughterard/Clifden route. Bianconi became immensely wealthy and was twice elected Mayor of Clonmel, Co Tipperary. Notes: Some of these observations were taken from an article written by Ronnie O’Gorman in the Galway Advertiser. He researched the following books: Poor Green Ireland – German travel writers Narratives on Ireland from before the 1798 Rising to after the Great Famine, translated and annotated by Eoin Bourke, emeritus professor of German at NUIG, recently published by Peter Lang AG, Switzerland. This page was added on 05/01/2013.